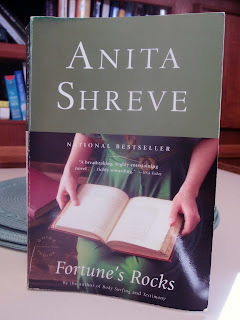 One of the books that I squirreled away on the boat some time ago for ”summer reading” was Anita Shreve’s Fortune’s Rocks. I keep a number of “emergency books” on our bookshelf in our dinette in case I “tire” from other summer reading I bring up from Florida. I’ve been reading William Trevor’s short story collection, Selected Stories, interspersing Thomas McGuane’s new short story collection, Crow Fair, focusing on short stories with the hope I will learn more about the art of the short story so I can successfully carry forward my own stories (thus far, the osmotic learning method has failed as it’s difficult on the boat to concentrate on writing – it’s just much easier to read). The Trevor collection has become increasingly maudlin and focused on rural Ireland, not that I mind either, but I felt I just needed a break. Although McGuane’s collection provides a stark contrast to Trevor’s, his writing reminding me more of a cross between Raymond Carver’s short stories and Sam Shepard’s plays, I needed a novel to break up the routine. Anita Shreve to the rescue! I’ve always admired Shreve, an Edith Wharton, in our midst. She loves to write period pieces or contemporary ones set on the New England coast, but at the core of her works are affairs of the human heart -- I’m thinking of The Weight of Water, Body Surfing, and Sea Glass in particular. Fortune’s Rocks is in that ensemble, a novel rich in 19th century language with Shreve’s unique eye to detail. As she’s successfully done before, she writes this novel in the present tense, rendering the reader a sort of eavesdropper onto unfolding events. She also juxtaposes the present tense narrative to the omniscient author’s eye, commenting on various social issues. It is a page turner or perhaps I should say a page burner as it is reminiscent of a high brow Harlequin Romance. It is the “steamiest” novel I’ve ever read by Shreve, particularly unusual given the late 19th century setting. It is even shocking in some respects, not because of the language but because of the story in the context of the times. Precocious fifteen year old Olympia Biddeford is the daughter of a prominent and wealthy Boston family who own a vacation cottage, formerly a commodious Convent, on the New Hampshire coast. This well connected summer community at Fortune’s Rocks borders Ely Falls, a mill town where immigrant Franco—Americans toil away in noxious factories. She and her parents arrive for their summer on the eve of her 16th birthday. Olympia’s perspicacity has not escaped notice of her father, who has removed her from school and taken upon himself the extensive education of his daughter at home. They are very close. 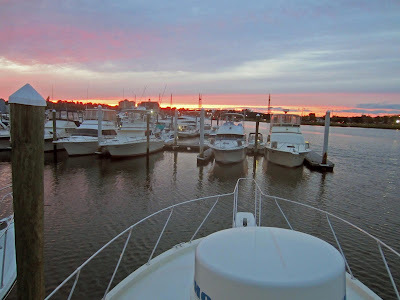 Shreve’s superlative prose sets the tone: It is the late morning of the day of the summer solstice, and through an open window Olympia is trying to capture on her sketch pad the look of a wooden boat, unpainted, its sails old, a dirty ivory. But she is not, she knows, terribly gifted as an artist and her attempts of rendering this boat are more impressionistic than accurate, the main purpose of her sketching being not so much to improve her drawing skills as to provide herself with an opportunity for idle thought. For at this time in her life, Olympia is much occupied with the process of thinking: not constructive thinking necessarily, and nothing that will produce brilliant solutions to problems, but rather drift thinking, like dreaming, the thoughts moving randomly from one place to another, picking something up, looking at it, putting it down again, the way people move through shops. But it is not only the maturation of her mind this summer, but the emergence of a woman from the body of a child. In this regard, she meets one of her father’s married friends, John Haskell, a physician who is opening a clinic in Ely Falls, a progressive-minded man. He is building a cottage in Fortune’s Rocks which he will soon occupy with his wife and children. Without going into spoiler details, suffice it to say, one of the novels Olympia is reading that summer is Hawthorne’s The Scarlet Letter. Olympia and Haskell are enveloped in a relationship that has disastrous consequences, Olympia becoming utterly ostracized in an era that is intolerant of straying from social norms. The novel reads like a mystery in many respects. It also reminded me a little of Dickens’ social commentary on the ills of 19th century mill life working conditions. In fact, as much as the novel is about the coming of age of Olympia, it is about her growing awareness of the schism between the wealthy and working classes: She watches a fisherman working from his boat not fifty feet off the rocks at the end of the lawn. A not unfamiliar sight, the boat bobs in the slight chop while the man hauls in wooden pots from the bottom of the ocean. The craft is a sloop, no, perhaps a schooner, laden with barrels of bait and catch – a charming sight, but testament only to a life more harsh than any Olympia has ever had to endure….Olympia had hardly ever given any thought to such men or to their families. She has passed by the rude fish shanties from which the lobstermen work dozens of times, seeing the shacks and the boats themselves and even the men aboard them as mere backdrop to the true theater of Fortune’s Rocks, the life of the privileged summer colony at its leisure; when of course it is much the other way around, these farmers of the sea being the time-honored inheritors of the native beach and its environs. And it strikes her again, as it has so often lately, how easy it is not to see what is actually there. Ultimately, the novel brings these two worlds in direct conflict: the Franco-Americans working in the mills of Ely Falls and Olympia’s, a clash of class and culture. It is a testimony to Shreve’s ability to create a compelling architecture for her novel – not merely a passionate love story, but one told on a broader canvas of issues. To say more is to reveal too much, but, for me, it was the perfect change of pace given the number of short stories I’ve been devouring. I’ve picked up still another novel (more on that in a later entry) from my “bullpen” as I’m not ready to return to my short story education.